MADURAI: An inspector of police in Tuticorin district who had falsely and vengefully implicated four dalits in a double murder case two years ago has been suspended. Tirunelveli DIG S Murugan on Thursday signed the order suspending T Selvam, who last served as inspector in Nazareth. Selvam has been on medical leave for more than a month, ever since a departmental inquiry conducted by Tiruchendur DSP V Gopal concluded that he had acted with "mala fide" intention. The inquiry report said Selvam acted with "preplanned ulterior motive, misused his position and cooked up a false case against four innocent people." 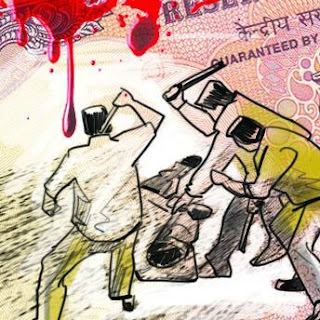 The case relates to the murder of a real estate businessman, Anthony Pandian, and his driver Shyamaraj at Thattaparai in Tuticorin district in October 2013. Selvam, who was Pudukottai inspector then, investigated the case as he was holding additional charge of Thattaparai station also. Linking the murders to a real estate dispute, Selvam arrested M Yesudasan, his brothers-in-law Sudalaimuthu and Varadarajan and the latter's father-in-law Paramasivam within hours of the crime. In July 2014, based on a petition filed by the four accused, court ordered reinvestigation into the case. Another inspector, Felix Suresh Peter, who conducted the probed, arrested the 12 real accused in April this year. During the investigation, it came to light that Selvam had allegedly forged complainant Ayyadurai's - Anthony Pandian's son - statement to fix Yesudasan and his relatives in the case. He also allegedly forged VAO Prem Sudhakar's signature to prepare a fake confession statement. These revelations have been recorded in Gopal's report as well. The four dalits were acquitted by a Tuticorin court on May 27 this year. Selvam allegedly nursed a grudge against them for resenting his mediation in a land dispute.